Only about 5 feet, 6 inches tall, but trim and erect, Martin Van Buren dressed fastidiously. His impeccable appearance belied his amiability--and his humble background. Of Dutch descent, he was born in 1782, the son of a tavernkeeper and farmer, in Kinderhook, New York. As a young lawyer he became involved in New York politics. As leader of the "Albany Regency," an effective New York political organization, he shrewdly dispensed public offices and bounty in a fashion calculated to bring votes. Yet he faithfully fulfilled official duties, and in 1821 was elected to the United States Senate. By 1827 he had emerged as the principal northern leader for Andrew Jackson. President Jackson rewarded Van Buren by appointing him Secretary of State. As the Cabinet Members appointed at John C. Calhoun's recommendation began to demonstrate only secondary loyalty to Jackson, Van Buren emerged as the President's most trusted adviser. Jackson referred to him as, "a true man with no guile." The rift in the Cabinet became serious because of Jackson's differences with Calhoun, a Presidential aspirant. 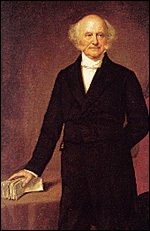 Van Buren suggested a way out of an eventual impasse: he and Secretary of War Eaton resigned, so that Calhoun men would also resign. Jackson appointed a new Cabinet, and sought again to reward Van Buren by appointing him Minister to Great Britain. Vice President Calhoun, as President of the Senate, cast the deciding vote against the appointment--and made a martyr of Van Buren. The "Little Magician" was elected Vice President on the Jacksonian ticket in 1832, and won the Presidency in 1836. 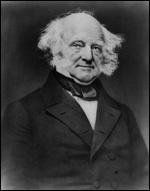 Van Buren devoted his Inaugural Address to a discourse upon the American experiment as an example to the rest of the world. The country was prosperous, but less than three months later the panic of 1837 punctured the prosperity. Basically the trouble was the 19th-century cyclical economy of "boom and bust," which was following its regular pattern, but Jackson's financial measures contributed to the crash. His destruction of the Second Bank of the United States had removed restrictions upon the inflationary practices of some state banks; wild speculation in lands, based on easy bank credit, had swept the West. To end this speculation, Jackson in 1836 had issued a Specie Circular requiring that lands be purchased with hard money--gold or silver. In 1837 the panic began. Hundreds of banks and businesses failed. Thousands lost their lands. For about five years the United States was wracked by the worst depression thus far in its history. Programs applied decades later to alleviate economic crisis eluded both Van Buren and his opponents. Van Buren's remedy--continuing Jackson's deflationary policies--only deepened and prolonged the depression. Declaring that the panic was due to recklessness in business and overexpansion of credit, Van Buren devoted himself to maintaining the solvency of the national Government. He opposed not only the creation of a new Bank of the United States but also the placing of Government funds in state banks. He fought for the establishment of an independent treasury system to handle Government transactions. As for Federal aid to internal improvements, he cut off expenditures so completely that the Government even sold the tools it had used on public works. Inclined more and more to oppose the expansion of slavery, Van Buren blocked the annexation of Texas because it assuredly would add to slave territory--and it might bring war with Mexico. Defeated by the Whigs in 1840 for reelection, he was an unsuccessful candidate for President on the Free Soil ticket in 1848. He died in 1862.